Jessica Pi has been videotaping weddings for more than 10 years. One of the things we fell in love with about Jessica and her company was her mantra. She told us, “I capture not only the events of the day, but the emotions as well.” We loved this because it’s an expression our business lives by as well. Oftentimes, many couples have looked forward to their wedding day for many, many days. But the day itself flies by! After it’s over, you’re left with the images, and/or the video. 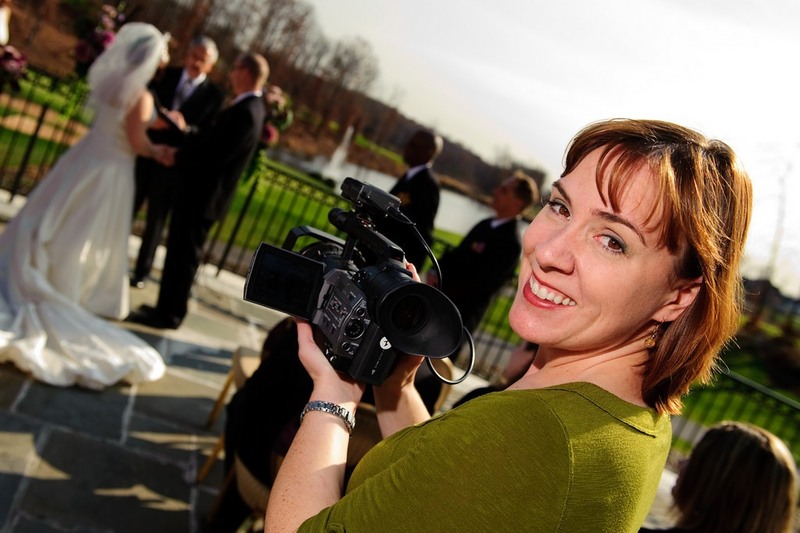 Being one of Northern Virginia’s finest Wedding vendors, Jessica Pi Productions sets an industry standard when it comes to videotaping events. A video done by her will be classic, and elegant and will also reflect your personal tastes and be a cinematic reminder of your story. And each wedding that’s covered will always have a second person videotaping for the ceremony. Jessica also sees the importance in getting educated to follow your passion. As she learned the “why” of film, she says it taught her to be able to dissolve and plan effectively. As a result, she has been able to own and operate a very successful video production company. Each wedding that Jessica videotapes takes 40-60 hours to edit. That’s a lot! Ever After Visuals, being photograhers, can appreciate the effort and time that Jessica puts into tellling the story of the day. Many clients go through their big day thinking that they will always remember everything. But there are simply too many details. As months turn into years, the memories become a little fuzzy. Jessica remembers many couples, who after their wedding regretted not having a video to sharpen the fuzzy lines around some of the fondest memories of their lives. With Jessica, the client gets included in their video whatever they want. How do you describe your “style”? Cinematic is the first word that comes to mind. Having worked in the film industry, and studied filmmaking, I think I am always looking to make a movie of the day’s events. What keeps you passionate about weddings? Every one of them is different, in terms of every couple being different, but every one is the same in terms of them all being so filled with love and joy. It’s a wonderful feeling being part of such a happy occasion, and that never gets old. Are you seeing any trends emerging in 2013/2014? I think now that the majority of people own HD TVs and Blu-Ray players, not only is HD becoming the norm, but I think moving pictures are becoming more valued. The idea of watching the movie of your wedding day is more exciting with such high quality footage. What distinguishes you from other vendors in your profession? Film and video production has been my passion since I started producing for a local TV show when I was 16. I have worked continuously since then in the film and video industry and, after learning film theory and production techniques at NYU Film School, have continued to learn and grow as a motion picture artist. What is one piece of advice in your profession that you feel you should share with every bride? Hire a professional videographer. I know that seems self serving, but, honestly, whether a couple hires me or another professional, I really believe it is so important to capture the sound and movement of one of the most important days in your life. A professional will know where to place microphones to get the best audio of the vows and the toasts, will know where to stand to capture the most perfect images of your first kiss and will be able to stay out of the way of guests having a great time at your reception while still recording the kind of footage that you and generations to follow will love to watch for years to come. Outside of weddings, what brings you joy? Spending time with my husband, family and friends. So all in all, we loved learning more about Jessica Pi Productions, and hope you did too!